Beijing, China: September 19, 2012— Raqsoft, the industry leading desktop BI software provider today officially released esProc, the new generation software for data computation and data analytics. The anticipated product which targets at optimizing analysts’ benefits has many outstanding features and advantages. This newly launched esProc is the typical desktop BI software for complicated structured data handling. By breaking the limitations of traditional OLAP tools, analysts can feel free to conduct bound-free data analysis in esProc, making pre-modeling unnecessary. In this case, the real time computation and analysis are realized easily, giving analysts more time to focus on business analysis. Besides, with esProc, the previous results can be referenced conveniently, allowing analysts research into the key point of targets and get the greatest value of data. 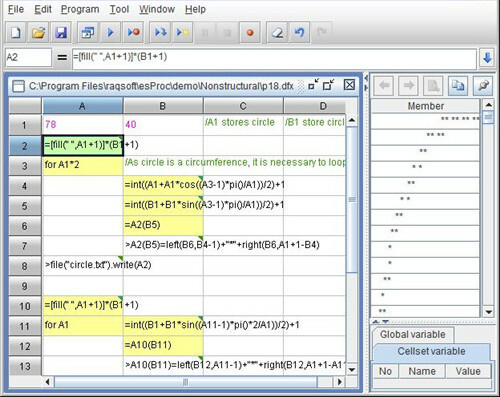 What’s more, the cell-style interface of esProc displays the layout and relations among computation steps to analysts more clearly and neatly. Comparing with traditional business intelligence tools like SQL and Excel, esProc, the desktop BI software has many superior advantages. The step by step feature of esProc is capable of dividing the complex goal into small objects and reusing the operation result of each step, greatly simplifying the complex computation. Thus, analysts who lack of SQL expertise can freely analyze data on their own. With esProc, data in Excel can be further explored due to the reason that it can load the data from Excel files for recomputation, such as query, filter, group and handle like SQL. In addition to the above mentioned highlights, esProc benefits analysts further more with various versions. esProc IDE is a desktop BI software running independently. While esProc JDBC will execute esProc as a JDBC driver for the convenience of other applications to invoke and get the result set. Detailed function differences about these two versions can refer to esProc editions statements. The trial versions for these two desktop BI tools are also available. What’s more exciting is that there is free version for lifetime as well. All the versions can be downloaded for free at Raqsoft official website at: http://www.raqsoft.com/download.html.